Stone steps may have been the first ones made, starting when some early man put down rocks to help him climb a hill. Stone steps today are more formal. 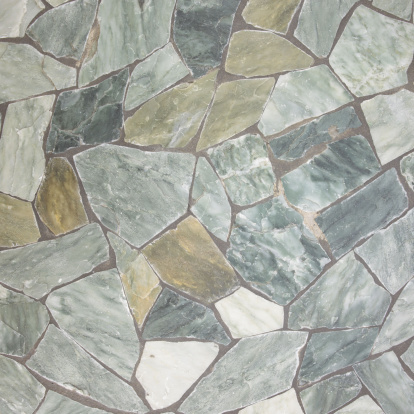 The two basic styles are large natural stones or cut stones fit together and sometimes installed with mortar. 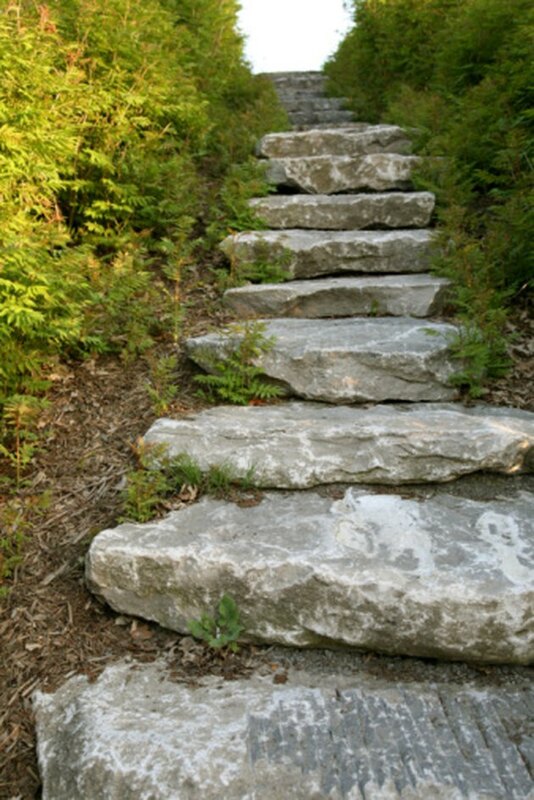 Big slabs of limestone, sandstone or fieldstone can make rustic steps that are attractive and functional. Cut stone, in squares, rectangles or other shapes, can make treads and risers for steps. Natural stones work best on mild slopes, while cut stones best on steep steps. This is one style of stone landscape steps. Measure the slope and decide on a path for the steps. Calculate slope by putting a pole at the bottom and a stake at the top with a level string between. Measure the distance from the string to the ground and from the stake to the pole. A drop of 33 percent, or 1 foot for every 3 feet of length, requires steps. Mark the path for the steps with stakes and builder's twine on both sides. Make steps at least 5 feet wide for a high traffic area or match the width to a connecting path. Design the steps. Plan treads at least a foot wide and risers at least 4 inches and preferably 6 to 8 inches high. Space treads at least a comfortable stride apart. On a gentler slope, use wide treads with fewer risers or use individual stepping stones set into the ground at comfortable descending intervals. Use big thick individual stones as tread and riser combined; with smaller stones, build risers and add treads on top. Decide on a type of stone. Limestone, sandstone and fieldstone can be obtained in large, fairly flat pieces. These can be laid with one stone slightly overlapping the one below as a riser for stability. Limestone, sandstone, granite, bluestone and many other stones are cut from quarries into regular shapes, usually rectangles or squares. Stack these for risers and lay them like pavers for treads. Set regular stones in mortar like bricks or lay them in sand beds. Excavate the step area with a shovel, in roughly the pattern the steps will follow, at least twice the depth of the stone to be laid. Dig out the approximate treads and risers, in effect making dirt steps. Put a base of medium gravel over the dirt and compact it tightly, then cover it with a layer of sand about 2 inches thick to create a base for the stones. The gravel provides drainage and the sand makes it easier to adjust and level the stones. Set the stones in place. Lay individual stones on the sand and level them with a level by adjusting the amount of base under them. Start at the bottom and work up, overlapping the stones at risers so the upper stone is on top of the lower one. Place riser stones first, if using regular blocks. Set them firmly in place, then lay tread stones behind them. Use a tape measure to adjust riser locations to conform to the width of tread stones. Use curbing stones for risers as an option. These are thinner stones set upright (like vertical pavers) to make the risers, with flagstones or other flat stones laid as treads, usually with a lip that extends over the riser. This is a good style for wider tread steps. Put down a base of wet concrete to set the curb stones in, extend them below the level of the tread stones so the treads will help keep them upright, then add the tread stones above, also in wet concrete.